FIGHT! 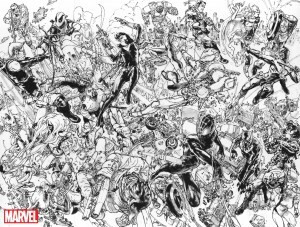 Artist Kim Jung Gi Covers CIVIL WAR II With Epic Black and White Connecting Variants! The heroes of the Marvel Universe collide this June – and today Marvel is pleased to present your first look at the epic connecting variant covers for each issue of CIVIL WAR II! Rendered by acclaimed artist Kim Jung Gi – Iron Man, Captain Marvel and the heroes that stand with them engage in all-out battle across these eight connecting black and white covers! A internationally renowned artist based in South Korea, Kim Jung Gi has become an internet sensation thanks to his ability to visualize an entire drawing before putting pen to paper. Known for his lush black and white illustrations, Kim Jung Gi brings his incredible talents to the Marvel Universe for the first time as he brings to life one of Civil War II’s seismic battles! Beginning this May with Civil War II #0 and continuing across all 7 issues of the blockbuster event, no fan can afford to miss out on these eight exciting new variants!